Unconfirmed rumors of a VR version of LA Noire first started swirling back in January, but today Rockstar finally made the announcement official. The VR version of the game will be arriving on the HTC Vive alongside the PS4, Xbox One and Nintendo Switch remasters on November 14. We’ll admit that when we first heard the rumors we were sceptical. LA Noire has received the least love of all of Rockstar’s franchises (aside from the oddity that was Rockstar Games Presents Table Tennis). While Grand Theft Auto has received over a dozen sequels and spin-offs, and Midnight Club and Red Dead have seen a couple of sequels apiece, LA Noire received just a single entry before its developer, Team Bondi, was unceremoniously shuttered. So the news that the game will not only be receiving a remaster, but also a reworked virtual reality entry, is music to our ears. Finally the game will be playable on current generation systems, and will see a new lease of life as a portable game. 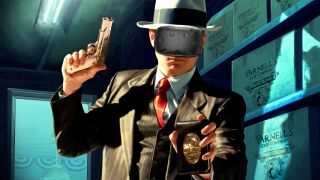 But the virtual reality release is what has us the most excited, because LA Noire might just be the most perfect match for VR that we’ve ever heard of. Although the act of playing games in virtual reality is certainly fun, undoubtedly its biggest strength is its ability to transport you to to another world. I had far more fun just wandering around Rick’s workshow in the Rick and Morty VR game than I’ve had in many other more ‘gamey’ experiences. But interestingly, the same can often be said of Rockstar’s games. Sure, the things you do in Grand Theft Auto are fun, but the things people most remember about those games are the cities themselves. They feel detailed, rich, and alive in the way that real-world cities do. This makes Rockstar’s games the perfect match for virtual reality, but the fast-paced multi-vehicular nature of Grand Theft Auto would be a terrible match for current VR headsets. Meanwhile, LA Noire is the polar opposite. While getting to each location requires a little bit of driving, the game is otherwise almost completely devoid of the fast-paced action that has come to define Rockstar’s games. Instead the game revolves around you picking your way through confined crime scenes, examining evidence (motion-controls anyone?) and interviewing suspects. In a move that seems almost made for VR, the game’s menu system even revolves around your police notebook, which you use to track evidence, and which would work perfectly as a prop in a virtual space. There are no complicated controls, and very little fast-paced action. It’s just you and the virtual world in all its beautifully rendered glory. Although it would have been great to see the whole game rendered in virtual reality, Rockstar has instead chosen to remaster a more conservative seven cases from the original game for the HTC Vive headset. We imagine this means that the more action-focussed missions will be omitted, although Rockstar is yet to confirm the exact missions that will be featured. Regardless, LA Noire was one of the most underrated games of the last-generation of consoles. While it would be amazing to see it gen a proper current-gen sequel, a VR remaster should add enough that it will feel almost like an entirely new experience. If Rockstar plays its cards right, then LA Noire might end up being one of the best VR games of 2017.